Inclusions: Private transportation, and local expert guide. Departure Points: Avignon, Arles and vicinity; Aix, Marseille and Toulon. Other departure points available, please inquire. Your private Provence tour starts with an English-speaking tour guide taking you to a lovely town east of Avignon called Isle sur la Sorgue. The town is called “the Venice of Provence” because of the many canals and branches of the Sorgue River that has its source just a mile away, in Vaucluse. The town is located in the agricultural valley of Comtat Venaisson at the foot of the Vaucluse mountains. If your Provence tour is on a Sunday, you can enjoy one of the most charming outdoor markets of Provence stretching along the boulevards lining the Sorgue River. Here you can find all the things that make Provence so special: local herbs, cheeses, poulet roti, fresh breads, olive oil, soaps, pottery, plants, fabric, antiques of all sorts and more. One of the highlights in Isle-sur-la-Sorgue is the numerous antique shops in town. There are countless treasures to be had from the town’s nearly 300 antique dealers and secondhand shops. The town hosts a festival on August 15 every year that draws more than 500 dealers from all over the world to sell their unique antiques. If desired, lunch can be a picnic from food you can buy from this lovely outdoor market. After lunch, you will go to Chateuneuf-du-Pape where you will enjoy a private wine tasting of the fine local wines. 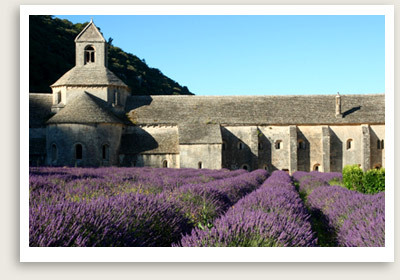 NOTE: Customize your very own Provence tour. Please inquire.